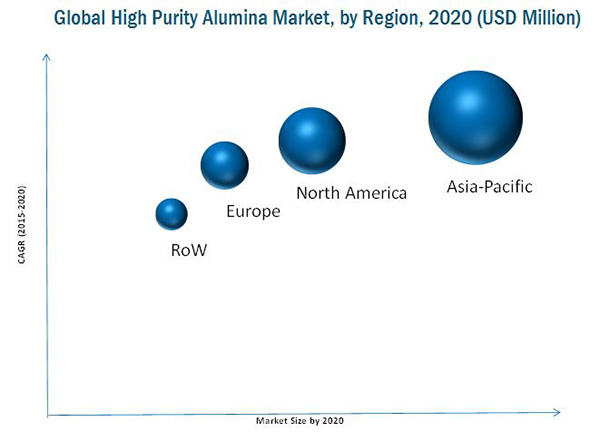 [138 Pages Report] The global high purity alumina (HPA) market was valued at USD 1.73 Billion in 2014, and is projected to reach USD 5.09 Billion by 2020, at a CAGR of 20.1% between 2015 and 2020. The global HPA market has been categorized on the basis of purity level, application, and region. In terms of value, the 4N segment led the global HPA market in 2014. Furthermore, various applications included in the study are LED, semiconductor, phosphor, sapphire, and others. The LED application accounted for the largest share of the global high purity alumina market in 2014. This large share is mainly attributed to the increasing demand of HPA in LEDs for various applications, such as home lighting, televisions, hybrid cars, and electric vehicles. On the basis of region, the high purity alumina market has been classified into Asia-Pacific, North America, Europe, and RoW. Among all regions, Asia-Pacific led the global high purity alumina market in 2014, owing to the increasing demand of HPA in the electronics sector in this region. The research methodology used to estimate and forecast the global HPA market begins with capturing data on key vendor revenues through secondary research. The vendor offerings are also taken into consideration to determine the market segmentation. The bottom-up procedure was employed to arrive at the overall market size of the global HPA market. After arriving at the overall market size, the total market was split into several segments and subsegments, which were later verified through primary research by conducting extensive interviews with key personnel, such as CEOs, VPs, directors, and executives. This data triangulation and market breakdown procedures were employed to complete the overall market engineering process and arrive at the exact statistics for all segments and subsegments of the market. The breakdown of profiles of primaries is depicted in the figure below. The high purity alumina market has a diversified ecosystem of upstream players, including raw material suppliers, along with downstream stakeholders, vendors, end users, and government organizations. Key players in this market include Altech Chemicals Limited (Australia), Alcoa Inc. (U.S.), Orbite Technologies Inc. (Canada), RUSAL (Russia), and Sumitomo Chemical Co., Ltd. (Japan), among others. The government and research organizations, raw material suppliers and distributors, construction companies, and industry associations are considered as critical stakeholders in this study. This study answers several questions for the stakeholders, primarily which market segments to focus in the next two to five years for prioritizing the efforts and investments”. Scope of the report: This research report categorizes the global HPA market on the basis of purity level, application, and region. It forecasts market volume and value as well as analyzes key trends in each of the submarkets mentioned below. The global high purity alumina (HPA) market was valued at USD 1.73 Billion in 2014, and is projected to reach USD 5.09 Billion by 2020, at a CAGR of 20.1% from 2015 to 2020. Increase in demand of HPA in varied applications, such as LED, semiconductor, phosphor, and sapphire, among others is fueling the growth of this market. Among all applications, the LED segment led the high purity alumina market in 2014. More than half of the production of high purity alumina is used in lighting, automobile headlights, and mobile phones backlights, among others. The shift from traditional incandescent light bulbs to energy-efficient and sustainable LED lighting systems has helped in increasing the overall demand for LEDs. The growing usage of LED lighting by both developed and emerging countries is projected to drive the demand for LED application segment in the high purity alumina market. On the basis of purity level, the high purity alumina market is segmented into 4N, 5N, and 6N. 4N high purity alumina serves to be the main source material used in the development of scratch-resistant artificial sapphire glass. They are also utilized in smartphones and portable tablet devices. The price of HPA depends on its impurity profile (that is, the content of silica and iron), product type (powder, block, cake, seed, pellets, ball, and ingot), and product characteristics (particle size and density). HPA prices are expected to decrease owing to its increased supply from small producers in China. Asia-Pacific held the largest share in the global high purity alumina market in 2014. The high purity alumina market in the Asia-Pacific region is projected to grow at the highest CAGR during the forecast period. China dominates the HPA market in the Asia-Pacific region, owing to technological advancements made in the electronics sector in this country. Expansions, new product/technology launches, joint ventures, agreements, and acquisitions are some of the most essential strategies adopted by key market players to achieve growth in the global high purity alumina market. Companies such as Altech Chemicals Limited (Australia), Alcoa Inc. (New York), Orbite Technologies Inc. (Canada), Sumitomo Chemical Co., Ltd. (Japan), and Bukowski (France) are actively present in the high purity alumina market. 11.5 Sumitomo Chemical Co., Ltd.
11.7 Nippon Light Metal Company Ltd.
11.10 Xuancheng Jingrui New Material Co., Ltd.
11.11 Dalian Hiland Photoelectric Material Co., Ltd.